Oreo fans might be fawning over the real color of a certain dress, or whether a picture depicting an obscure creature shows the silhouette of a cat or crow, but little do they know that an age-old optical illusion might have been sitting in their pantries all along. To Lee Breslouer, who pens food-related articles for sites like Thrillist, the iconic Oreo cookie has always appeared black. “But guess what? Some people think the cookie is brown,” he said. 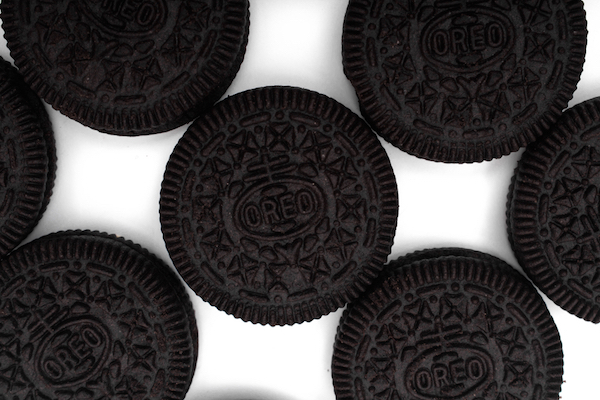 In their defense, some of the illustrations that appear on Oreo’s social media channels portray a near-black cookie, while a number of its product photos depict a snack that’s dark brown in color. Upon looking up the FAQ page set up by Oreo’s parent company Mondelēz, Breslouer discovered that the brand deliberately kept the chocolate sandwich cookie’s actual color a delicious mystery. “We do not have a color assigned to the cookie portion of an Oreo. Some people think the Oreo is a shade of brown, while others view the color closer to black,” the company confirms. No matter the answer, fans will be appeased with a cool glass of milk to dunk their cookies into.